The big selling point for this superb recording is the very first track, Malcolm Boyle’s Thou, O God, art praised in Sion. In a funny way, this can be said to be the Anglican church’s parallel to Allegri’s Miserere, not in any musical sense, but in its back-story. Composed for the Chester Cathedral choir by Boyle in 1937, five years into his tenure as Cathedral Organist and Master of the Choristers, it was never published and after his dismissal in 1949 (under something of a cloud – he remarried after a divorce) it got buried deep in the cathedral’s music library and started gathering dust. However, from 1946 Boyle’s assistant organist was a certain George Guest who was to achieve some eminence at St John’s College Cambridge a few years later. Guest, apparently, had been so impressed with Thou, O God, art praised in Sion that at Cambridge he rewrote it from memory, and for a number of years, the anthem was in circulation amongst those British cathedrals where Guest had some influence, either directly or through his former choral and organ scholars. It was eventually published in 1987 and is now, according to its publishers, their “no.1 best-selling piece”. So it should be, it is a fabulous anthem and one of the hidden gems of the English cathedral repertory. Here it gets a gloriously forthright and at times exhilarating performance, Philip Rushworth easily navigating between its passages of celebratory zeal and its more intimate moments of reflection – there’s a gorgeous quality to the treble line in the “Thou wilt keep him in perfect peace” segment. 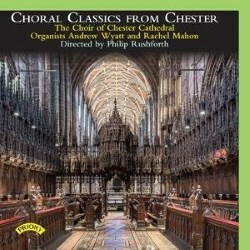 The organ part, closely interwoven into the fabric of the anthem, is deftly handled by Andrew Wyatt, who is utterly sure-footed on the Chester instrument, and the recorded balance between choir and organ is superb. The Malcolm Boyle anthem is by no means the only one here which might be regarded as one of the great secrets of the English cathedral musical tradition. Indeed, “Overlooked Choral Classics” might be a more apposite title for this disc, for while everything here is a true gem, brilliantly written and a robust addition to the repertory, with a few exceptions, none of these anthems is really a staple of the music lists of cathedrals across the country. Perhaps Orlando Gibbons’ Great Lord of Lords is one of those exceptions; which is probably just as well since this rather cumbersome account does not show it in its best light despite Rachel Mahon’s elegant support on the David Wells chamber organ. Of the other early pieces on the disc, Thomas Tomkins’s Thou art my King, O God does not fare much better, although the girl choristers bring a refreshing lightness and clarity to the polyphonic lines of John Amber’s O ye little flock. At the other end of the time-frame, the most recent anthem here is Philip Moore’s 1980 All Wisdom cometh from the Lord. Its angular rhythms, abrupt changes of direction and almost recitative-like setting of lines of text are superbly delivered, and Damian O’Keeffe proves a suitably firm voiced baritone soloist. The final transformation into the quasi-plainchant “Teach me O Lord” is a moment of pure and unquestionable musical magic. The remainder of the programme is devoted to 19th and early 20th century works which show the Chester choristers off to their very best. It is good to hear Edward Bairstow’s expansive If the Lord had not helped me, an anthem overshadowed by his more popular but (on the evidence of this vividly colourful performance) by no means superior Blessed City, Heavenly Salem, and while most of Stanford’s choral anthems seem to have been overshadowed by his canticle settings, the performances of the two presented here make pretty compelling cases for them as major contributions to the English choral repertory. Andrew Wyatt excels in the surging organ accompaniment which underpins the first part of For Lo, I raise up, while the girl choristers and lay clerks breast unflinchingly the extremely turbulent waters of Stanford’s dramatic setting of Old Testament words (although confusingly the booklet includes Biblical verses which are not part of the anthem) with Rushworth firmly in command and steering a clear-sighted passage through this almost operatic setting. With such excellent singing, Philip Rushworth’s superlative direction, some fabulous organ playing and a splendid recorded sound, this is a highly recommended release. However, bearing in mind that it is highly likely that even the most dedicated followers of English Cathedral music will find something revelatory here which they have not experienced before, it is an absolute must-have for any lover of English cathedral music.